In the eyes of Eugenia Rentería, Watsonville is a community of dreamers, of hard-working people who want to empower others and bring communities together. It’s a vision she feels she shares not just with her business partner and family members but with friends, co-workers and other filmmakers like her. That was one of the reasons behind “Sharing Stories/Compartiendo Historias” a five mini-film series of individuals talking about their personal experiences — two of which will premiere during the Watsonville Film Festival on March 30. Rentería’s short films on the lives of Eduardo Vela, assistant superintendent at the Monterey County Office of Education, and Jessica Sierra, a student retention specialist at Cal State University Monterey Bay, are two among seven stories that will be shown in the “Inspire — Short Films” selection of the Watsonville Film Festival. 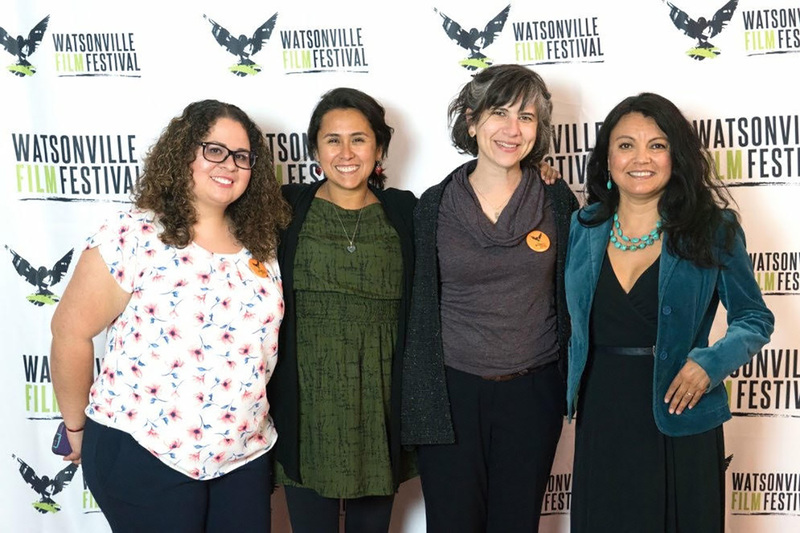 The festival runs from March 28-31 at the Watsonville Youth Center, 30 Maple St. About 20 films will be screened, culled from more than 54 submitted, said executive director Consuelo Alba-Speyer. “We went through a very meticulous process. It’s a decision we take seriously,” she said. “We have a very professional programming team of all filmmakers and photographer. We all watch movies for months, we give them a score sheet then we have a big, long meeting” to make the final selection, Alba said. The festival combines local stories produced by local, emerging talent with films that are being shown in the national film festival circuit – movies like Collisions, which recently won “Best Audience” award at the Mill Valley Film Festival and Best Audience Narrative Fiction at the San Francisco Indi Film Festival. Born in Zacatecas, México, Rentería arrived in Watsonville when she was 12 years old. After graduating from San Benito High in Hollister, she enrolled in the Humanities and Communications major at Cal State University Monterey Bay. A year later she realized what she really loved was making movies, something she had developed while filming family adventures and vacations. For her sophomore year, she transferred to Cinematic Arts. “When I told my family ‘This is what I want to study,’ they were worried. ‘Are you going to make enough money?’ But I knew I was in the right place,” she said. Her films are in good company. The festival opens on Thursday with “Singing Our Way to Freedom,” which chronicles the journey of Chicano icon Ramón “Chunky” Sánchez from his beginnings as a farmworker in California to receiving a National Endowment for the Arts’ National Heritage Fellowship in 2013. The film won the audience award for best documentary at the San Diego Latino Film Festival. Director Paul Espinosa will attend the Watsonville festival for a Q&A after the screening. On Friday, the film festival will host the “Imagine — Short Film” program featuring the work of local and international filmmakers, including the premiere of Service With a Smile (SWAS), directed and produced by young filmmakers at the Digital NEST, a Watsonville based computer storytelling lab. The “Inspire — Short Films” portion, a mix of documentary, testimonial and fiction short films that focuses on the struggles and triumphs of Latinx lives in California, will run at 2 p.m. on Saturday. Mexican actor Alejandra Herrera will participate in a Q&A after the screening of Tiempo de Lluvia / In Times of Rain, a fiction film about tradition, migration and healing from an indigenous perspective. The screening starts Saturday at 4:30PM. Rentería will also participate in a Q&A. It’s the first time Renteria has entered a film festival, and she’s excited to share her work with a larger audience, she said. Given a lack of infrastructure and adequate venues in Watsonville, production of the festival has been the biggest challenge since its inception seven years ago, Alba-Speyer said. The event has been held at almost every possible venue Watsonville has — from the old Fox Theater to the newer Green Valley Cinemas to the Grange, to the Appleton Event Center, which was supposed to host this year’s event until that fell through just a few weeks ago. n Voices of Monterey Bay is a community sponsor of “Inspire — Short Films,” which takes place 2 p.m. on Saturday, March 30, at the Watsonville Community Center. Adults $10. For more information, visit the WFF website here.